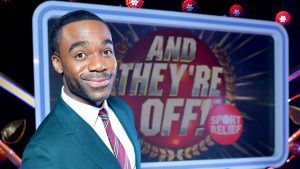 New Ore Oduba physical challenge show. Celebrities take on wacky and muddy obstacle course races whilst members of the public try and predict the winners for big prizes. How wacky and large scale remains to be seen – looks like they’re pre-records if the trailer is anything to go by so anything is possible. Might be fun. Quite a neat little format, that. I like the fact that there’s a quiz element, I think the question difficulty is pitched about right, and the fact that most of them are about popular culture and celebrities fits the theme. This was OK, love me a rat-race style format, but it’s a real pity the races were generally a bit underwhelming (amazed Dave Lamb managed to be sarcastic over them, there’s so little content) and featured very little surprise as to who was going to come last – wish this had been given any sort of budget really, and some sort of thought in the mixture of celebs. The Leveller felt like a great game wasted in this context really – would have fit SdH/Dog Eat Dog really well. Liked the picture quiz element, but wish the pictures were a bit bigger. The BBC have been smart to put this out early-evening rather than as the centrepiece. I thought this was decent, Ore Oduba was a good host and I enjoyed Dave Lamb’s commentary (he’s fantastic on Come Dine and Gory Games). I do wonder if they will keep the games the same each week? I imagine the races may be the same, but The Leveller will change. I also enjoyed the quiz, but thought it was slightly unfair with there being two sports people. Next week there is one sports person (Helen Glover, Olympic rower). 2.66m/14.8%, which doesn’t feel completely awful for Saturday early evening, although that probably won’t be increasing in future weeks. Number was pretty consistent throughout. Suspect this may end up later in primetime and Wedding Day Winners get banished to 6pm. Pointless Celebrities will save the day yet again. This was ok. I didn’t mind it. If this gets a second series, cool but I wouldn’t notice if it didn’t. It felt like it needed bigger races and a bigger runtime. I think 45 minutes would have been ideal for this. Ore did seem a bit CBBC-ish in his presenting which makes sense for a family show but the hosting did seem a bit lackluster. IT turns out watching the celebrities falling off the same obstacles in exactly the same way isn’t remotely interesting. This would have been brilliant as a one-off, but a full series is too much. It’s the same reason everyone hated Can’t touch this, and I’m surprised they haven’t learned from it.